Our attitude to the volatility and upsets that have occurred in Foreign Exchange since late last week, which complemented a dramatic sell-off in equities and in Emerging Market currencies, is that they are symptomatic of a return to normality after post Great Financial Crisis extreme measures, which were introduced by monetary authorities in the US and elsewhere to combat the risk of recession and even depression. Normality means that the US dollar regains its status as the world’s reserve currency and becomes stronger in response to the elimination of Quantitative Easing and the eventual raising of US interest rates. It was this expectation that caused the rise in such pairs as the USDJPY in the fourth quarter of last year. More recently, however, the return to normal currency behaviour seems to have taken a back seat, ironically in response to the correction in equities and EM currencies, which are themselves pre-requisites for the ending of the crisis measures. And it might be that we have a little way to go in this process. 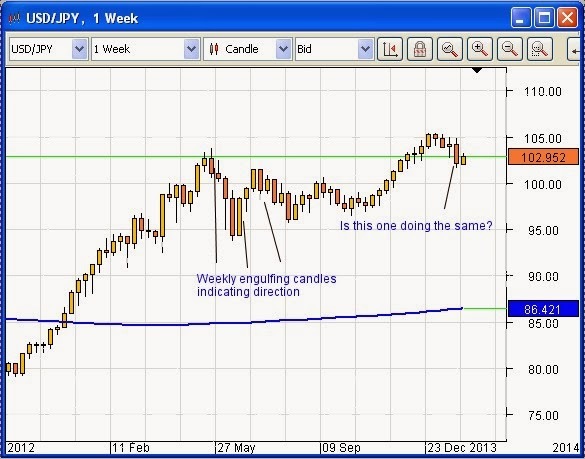 The chart above shows the USDJPY weekly chart. Engulfing bars, or candles that cover the one immediately to their left, are spoken of by technical traders as one of the more convincing indicators of price direction. It can be seen that this was indeed reliable in many recent cases. Now, last week’s bar is an engulfing bar and it is coloured red, which might indicate that direction for the next two or three weeks for this pair is to the downside. We must acknowledge the fact that today is the last Fed day for Mr. Bernanke before he hands over to Ms. Janet Yellen as chair of the US Federal Reserve. This fact aside, we will be taking the usual precaution of remaining on the sidelines in the expectation that the market will run around like a chicken with its head cut off after the Fed monthly statement, no matter what it says. This kind of volatility can damage one’s account equity, and today is likely to be no exception. Then all eyes will be on Janet Yellen. We wish her well in the job she has taken on, the major challenge of which, for the coming twelve months at least, is probably going to be to achieve the orderly reduction and then the total elimination of Quantitative Easing. Later in the global day, at 8:00 PM GMT, the Reserve Bank of New Zealand will announce its interest rate decision. The Kiwi has fallen of late against the Aussie dollar, in line with a perception that it joins those currencies that represent risk and is tied to commodities, combined with a squeeze on those participants that were short the AUSNZD pair prior to Thursday of last week, including ourselves, but the decision of the RBNZ about rates will have a bearing on the AUDNZD pair. The US Fed announcement could offset any effects the RBNZ might have on NZDUSD.